You’re 3,000 miles away from the nearest coast, it’s 10am and 38°C outside, and it’s a Muslim region so cold beer and short shorts are not an option. How on earth can you keep your cool? I must admit that my initial research on this topic was essentially ice cream-focussed in nature. On a particularly hot, dusty day in Yarkand, the gentleman pictured was doing a roaring trade in ices and free television. * I had a brief internal debate on the potential for getting seriously ill but was won over by those wonderful blocks of ice and 3 yuan (30p/50¢) later I had a small cup of melty-looking ice cream, and that was the start of a minor addiction. Xinjiang’s ice cream is somewhere between sorbet and soft-serve ice cream, and while you can buy exotic flavours such as walnut and saffron, the unflavoured type seems to be the most popular. 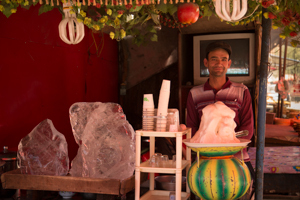 Avral, an anonymous booth on Seman Road, Kashgar – for homemade cherry syrup sundaes. Putaoyuan, Urumqi – sit underneath a great rack of grapevines in the middle of the city and people-watch over a frosty bowl of dogh. Walking through Hami last night, I saw some Uyghur gentlemen sipping at something that looked like extremely cold and cloudy beer. Curiosity piqued, I asked what it was and discovered that is was kvass. Kvass is a drink of lightly fermented grain – weak beer, basically – flavoured with a sweetener, in this case locally-grown raisins. The result is vaguely alcoholic, very fizzy, a little sweet, and slightly acidic. Delicious. Best of all, there’s a small argument to be made that kvass is actually good for you – full of B vitamins from all that yeast, apparently. Avzal, middle of central crossroads, Hami – for homemade kvass and the smoothest ice cream in town – owner Shukrat has been serving up mugs of kvass for 17 years. Unlike Hong Kong, the heat in Xinjiang is very dry, which thankfully means that there is an actual difference between temperatures in the sun and in the shade. The hottest place in the entire region is Turpan, where summer temperatures regularly reach the high 40s. In the middle of the day, the only sensible thing to do seems to be to head for shade. Fortunately, someone has seen fit to plant the length of Qingnian Lu, a street in the town centre, with an overhead trellis thick with grape vines, so you can stroll in the shade as you snack on grapes for free. 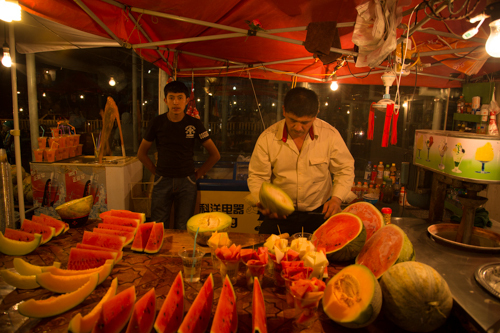 Xinjiang has the most delicious melons in China. The long hours of sunshine keep sweet and fragrant fruit in the markets from early spring to late autumn. The problem that the solo traveller faces is that a single melon is so big that you’re stuck with it for a few good days after you first cut into it – ick. This terrible dilemma has happily been solved by some thoughtful entrepreneurs – street vendors will cut a fresh slice from their stock for you to enjoy. Take a tissue to help you mop up the juice. If none of the above has done the trick, it’s clearly time to head for the hills. You won’t be the first person who has needed to escape from the heat of Xinjiang’s deserts. There’s a well established habit of bishu (避暑, avoiding the heat), or escaping from urban centres in the summer. From Urumqi – head to Heaven Lake, just outside the city. With a pretty lake, snowy mountains and swathes of thick forest, this is an attractive destination just as long as you don’t mind sharing the beauty with a few thousand day-trippers at weekends. Slip around to the far side of the lake if it all gets too much, and chances are you’ll find some Kazakhs and a yurt to stay in for the night. 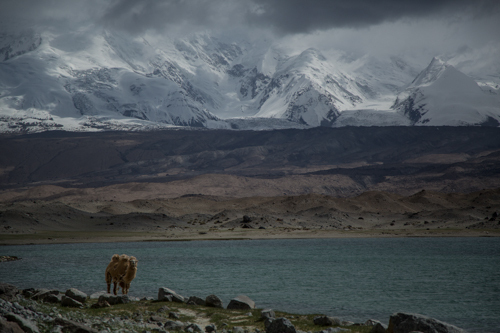 From Kashgar – Tashkurgan and the Karakoram Highway. If you need to cool down in a big way, head up to the glacier above Lake Karakul – at 5,300m, the altitude will ensure you keep cool even if the sun shines or take a dip in the icy lake water. Less active types can make for Tashkurgan and munch on kebabs in the shade of the mountains in the Shanhua Restaurant’s garden. *What do ice cream stalls in Xinjiang and every cha chaan teng in Hong Kong have in common? They’ve realised that top-volume soap operas pull in the punters.